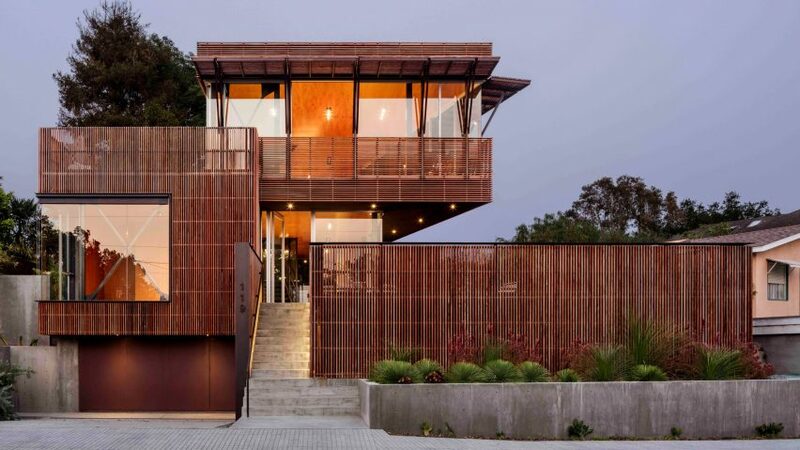 Stacked volumes made of steel, concrete, wood and glass form this family home in California, which architecture firm Shubin Donaldson created for an industrial designer. Los Angeles-based firm Shubin Donaldson completed Skyline Residence for an industrial designer and his young family living in Santa Barbara, a coastal city in central California. 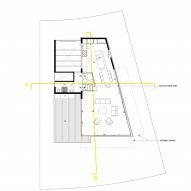 The architects note the client was heavily involved in the design process. "This stunning home is the result of a very productive and satisfying client/architect relationship," said Shubin Donaldson in a project description. The site posed various challenges, as it is sloped, narrow and oddly shaped. Zoning requirements and a neighbourhood context provided further constraints. In response, the team designed a slender, three-storey building with setbacks and cantilevers. The structural frame is made of concrete and steel, which are intended to "maximise the formal responsiveness of the structure". 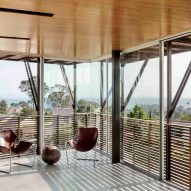 Facades consist of large stretches of glass and ipe wooden screens, which help reduce solar heat gain. "Being one of the few new construction homes in the area, it was important that the front facade be inviting and warm," the studio added. The exterior material palette is carried indoors. Rooms feature concrete flooring, metal columns and Douglas fir plywood ceiling panels. In most areas, the home's concrete walls are left exposed. 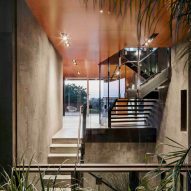 Shubin Donaldson placed a generous living room and kitchen on the top floor of the 2,600-square-foot (242-square-metre) residence so that the homeowners can enjoy views of the Pacific Ocean to the south and west. 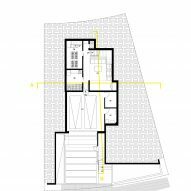 The second floor is occupied by bedrooms and a living room that opens onto a terrace. The ground level, which is wedged into the sloped site, contains a den, laundry room, garage and storage space. The different levels are accessed by a staircase made of concrete and steel. 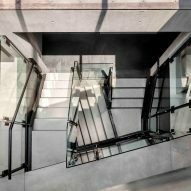 "The house has a central stair that cuts up through the home, with a skylight above that allows daylight to penetrate the home and light it from within," the studio described. Ample outdoor space is provided on the top two levels. Ocean breezes help cool the home, and daylight fills much of the interior. "The benign climate encourages an indoor-outdoor living style, and the home flows onto strategically placed patios," the team added. "Every square foot of this small site is used as a living area, whether indoors or out." The city of Santa Barbara is known for its temperate climate and scenic coastal landscape. 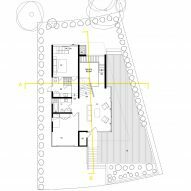 Other homes in the area include the low-slung Minimalist Urban Residence by Anacapa Architecture, which was designed for a young entrepreneur. Photography is by Jeremy Bittermann.